Something tells me that December’s arrival will mean a steady diet of cookies, candies, cupcakes and other delicious goodies on this blog. I’ve already got quite a few treats lined up to share in the coming days and weeks, but first, I figured we should get this vegetable dish out of the way! Brussels sprouts: a few weeks ago I wasn’t even sure I liked them. I’d seen them in the store and kept meaning to buy them but it never happened. Then, they were featured at one of our Thanksgiving dinners and I finally tried them. I was a big fan, and needless to say, they made their way into my basket the very next time I went to the store! I’d already decided to roast the Brussels sprouts after seeing the idea on Jen’s blog, My Kitchen Addiction. The first thing you want to do is wash your Brussels sprouts. Then, you prep them by trimming the stem end and cutting them in half, discarding any loose or discolored leaves. Next, you’ll move the Brussels sprouts to a rimmed sheet pan and treat them the same way you might treat any vegetable you were roasting: drizzle with extra virgin olive oil and season with kosher salt and freshly ground black pepper. Here, balsamic vinegar is also drizzled over the Brussels sprouts to give them just a bit of extra flavor. The quantities of olive oil and balsamic vinegar you’ll use will vary depending on how many Brussels sprouts you are making and it’s fine to approximate – no need for precise measurements. Toss the sprouts to evenly coat them with the olive oil, vinegar, salt and pepper. Finally, roast them in an oven preheated to 375 F for about 35-40 minutes, or until they’ve caramelized and are crisp on the outside and tender on the inside. Jen has some great photos and tips on her blog as well if you’d like to check them out. 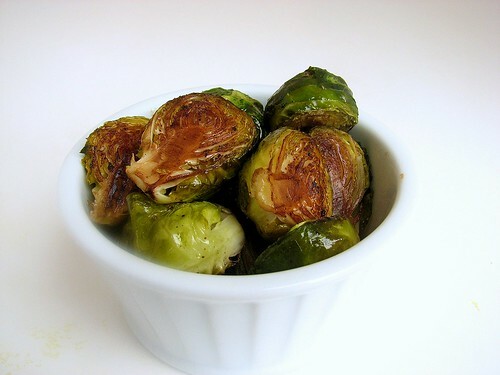 16 Responses to "Balsamic Roasted Brussels Sprouts"
Roasting them is delicious! the only other way I’ve made them besides roasting them is I parboiled them, then tossed them in browned butter w/ garlic and then sprinkled w/ fresh gorund black pepper. The butter isn’t as healthy as olive oil so I rarely do it that way, but it’s good sometimes. But there is nothing like the caramelized goodness that comes from roasting them. Mmm…. So glad you liked the Brussels sprouts! I made these on Thanksgiving, as well, and my brother who claims to hate Brussels sprouts actually had seconds. My mom didn’t even know what to say! I might have to give these a try. I’ve never been a big fan of Brussels sprouts, but Paul loves them, and I love roasted veggies in general, so maybe this will allow us both to be happy! I love roasted brussels sprouts! I’ve never tried drizzling balsamic on them, but I’m going to do that next time. I usually just do salt, pepper, olive oil, and sometimes random seasonings. Roasting is absolutely the way to make brussels sprouts yummy. Balsamic is a bonus! I’m glad you are a Brussels sprouts convert! They are such an easy vegetable to prepare and so delicious. If you ever want a slightly more decadent recipe, I just tried a yummy recipe for braised sprouts that was on Smitten Kitchen this week. I’ve actually never tried brussel sprouts. After reading this post, I’ll definitely give them a shot! Roasting definitely makes everything better (I’m convinced) and balsamic vinegar sounds like a wonderful way to enhance the flavors even more. I’ve gotta try this! Don’t have to steal this one, as I have about a hundred ways to make the little sprouts…love, love, love them! I think I have the only kids in the world who love brussels sprouts and eat all I make all the time! YUM! Yours look beautiful. I love roasted brussel sprouts, but have never thought to use vinegar. I bet they were tasty. They look beautiful. i love brussels sprouts and these definitely look tasty! I love brussels sprouts, especially roasted ones. These look fantastic. You’ve inspired me, I really need to go buy some brussels sprouts! Made these last night for my family and I will admit that I had NEVER had a brussel sprout in my life, but we all LOVED them! Thanks so much for the new veggie recipe! !